With just over a week to go until the presidential elections in Kazakhstan on April 3, there is little sign that the poll has caught the public’s imagination. With the main opposition party representatives either boycotting, refusing to take part or disallowed from the election, the electorate has been left a choice between four men of varying shades of grey. Here’s Kazaxia’s guide to who’s taking part with a look at their campaign posters that are on display in the centre of Almaty. Hot favourite to win the poll is the incumbent Nursultan Nazarbayev – he’s joined in the vote by eco-warrior Mels Yeleusizov, diehard commie Zhambyl Akhmetbekov and the joker in the pack Gani Kasymov. 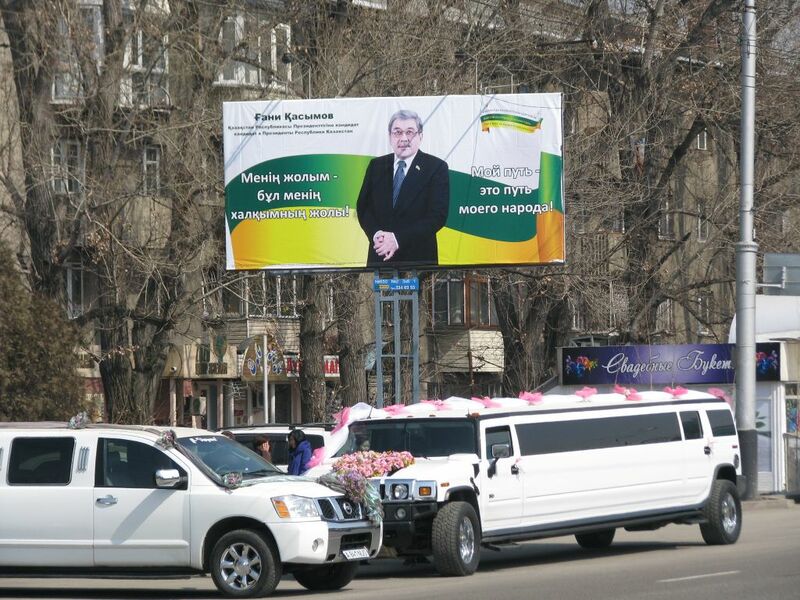 The sitting president looks serious in his campaign poster that appears all over Almaty. In office since 1991, he doesn’t need any catchy slogans – his poster merely reads: “We’re voting for the Leader”. His posters are placed apart from those of his opponents as he maintains an aloof position above the rough and tumble of politics. Trying to win the green vote is long-term environmental campaigner Mels Yeleusizov. 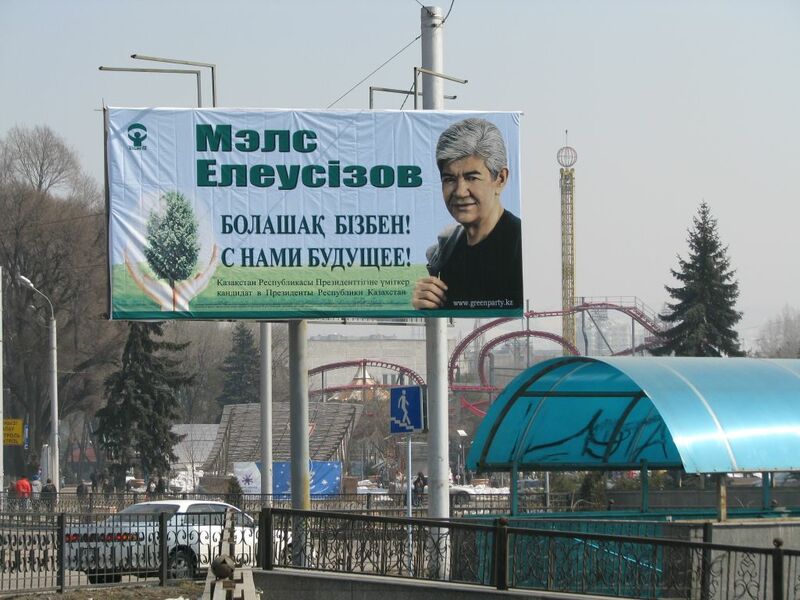 Often to be found clearing up his compatriots’ litter and planting trees, Yeleusizov looks down sternly at motorists from his pedestal on a flyover in the centre of Almaty. Maybe he’s trying to prick the consciences of the jeep-driving masses as they sit in traffic on their way home. Kazakh workers of the world unite! 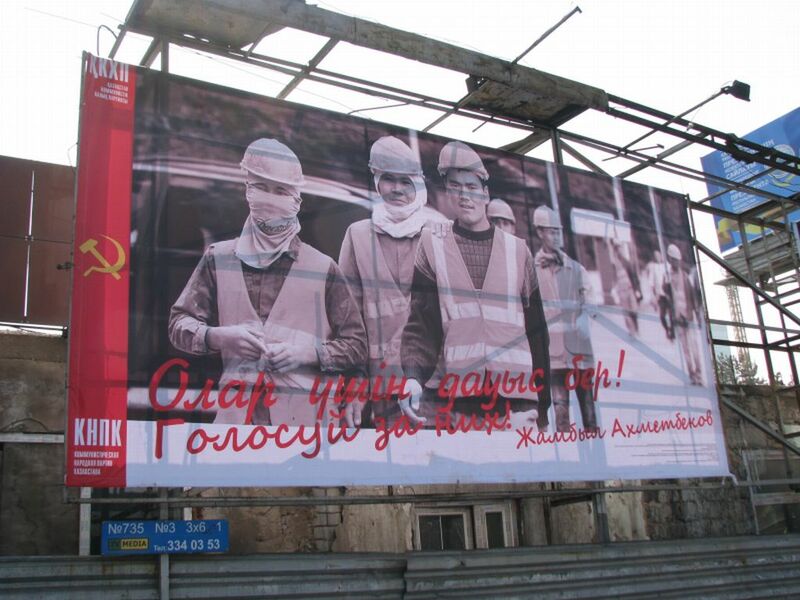 The Communist People’s Party of Kazakhstan, as opposed to the Communist Party of Kazakhstan which is not fielding a candidate, is presenting a gritty, working class image to the voters with blue-collar workers posing in their mines and factories. Somewhat appropriately, their billboard is attached to the side of a building site. 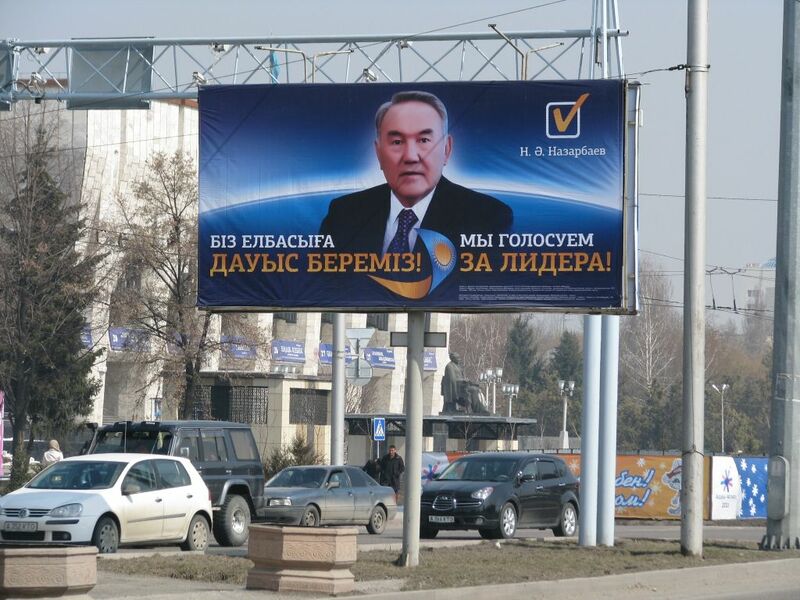 The joker in the pack is Gani Kasymov, head of the pro-Nazarbayev Party of Patriots. Earlier in the campaign, he shied away from an interview with Radio Free Europe when he realised he would have to answer questions about what he stood for. His campaign poster reads cryptically “My way is the way of the people”. Is he being secretive or is it just that he doesn’t have any ideas?